Oh, Reva... how you have earned this one! *Sigh* Now she gets to ride off into the sunset with Prince Charming. (Who, in my mind, is the Prince Charming/James from Once Upon a Time, but I digress...) I'm so glad that Reva finally got the love that she deserves because she is gorgeous. 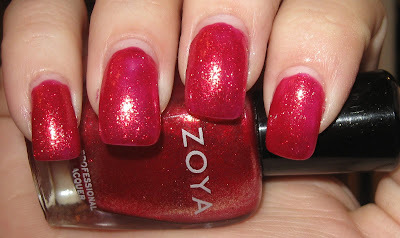 A hot pink with gold glass flecks, Zoya Reva is an absolute stunner. And here she is in the shade! I really considered using this color for my holiday manicure, but chose to go with something a little more representative of Chanukah. Don't get me wrong, it's sparkly (which you know, I'm all in favor of), but I wanted to go against the trend of bright pink and red sparkles. On the subject of the holidays, this will be my last Zoya post until the New Year, as I am traveling with my family on vacation. Our first stop will be Florida to visit my grandmother and then we're heading out on our third annual cruise (technically, cruise #5 for us… but the other two were spaced further apart). We'll be making stops in St. Thomas (I have been once and it is LITERALLY paradise), Antigua, Tortola, and the Bahamas. I'm going to schedule posts through New Years Eve, but none will be Zoya. They'll be a hodgepodge of various nail art and swatches I have been collecting over the past few months for the occasion. But I promise, it's going to be pretty cool. Keep an eye out for a special post tomorrow for a giveaway that will run while I am gone, as my holiday present to you all! As a result of my absence, I'm going to give you options for a New Years Day-themed Zoya post and please pick the polish you would most like to wear for a New Years Party: Charla, Mimi, Jo, Jana, Petra, Dree, Nimue, Tao, Kristen, Jo, Breezi, Mira, Colbie, Kotori, or Valerie? I hope you all have a great holiday, whether it be Christmas, Chanukah, or Kwaanza and enjoy your vacations. I'll try to post pictures while I'm gone, if my iPhone (and Verizon) cooperate. I think Kotori would be a great NYE color! I like to see Jo next! Have a great vacation! Reva is gorgeous! I vote for Jo next (love Jo)! Happy Holiays & enjoy your trip! On another note, I love your Reva swatch! I vote for Tao for your New Years mani! Enjoy your trip! It's sound like a lot of fun! I LOVE blues and glittery goodness for New Years Eve, so I'm definitely going to have to choose Charla!